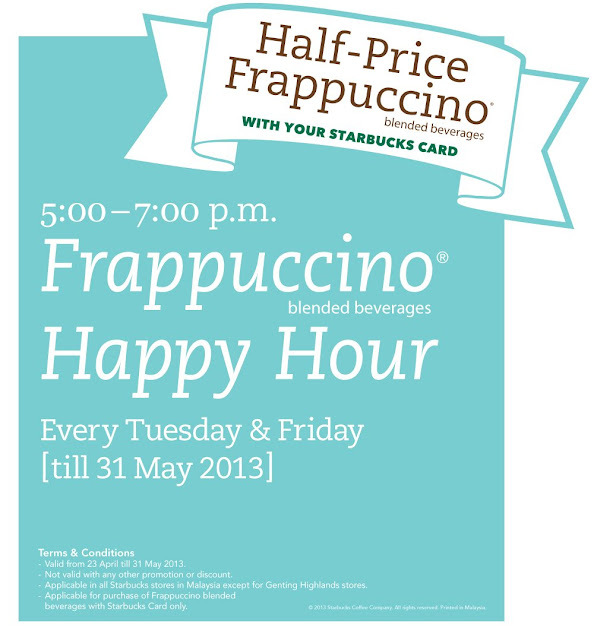 Bahaha, so how many of you are aware of Starbucks Frappuccino HAPPY HOUR! Well, have been waiting for this since all year long, like a kiam siap cheapskate hahaha. Gives me an excuse to have coffee because half price what! As the poster above, there is happy hour from 5pm to 7pm on every Tuesday and Friday until 31st May 2013! You need to have a Starbucks card in order to enjoy this happy hour thingy and half price is only applicable to Frappuccino blended beverages! I remembered when I first drank Starbucks, I only knew how to buy Hot Chocolate and I was already so proud because I recalled Starbucks was some 'atas' place. That was when I was about 12 or 13 years old? 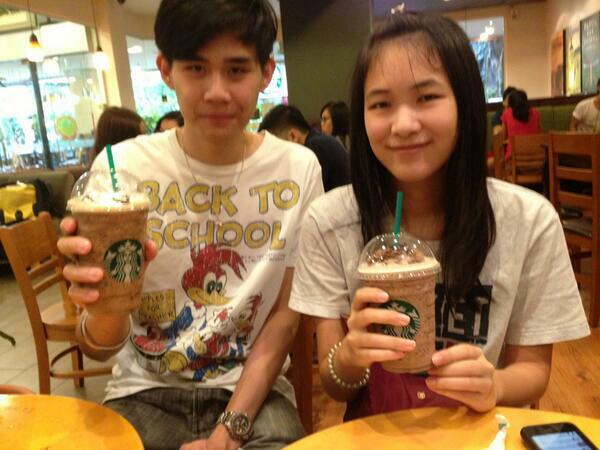 Then I advanced to drinking mocha frap and ever since then, tried other fraps. Enjoyed the promotion TWICE already with the same people, Illi and Terry! Although Illi did not get anything because Starbucks Malaysia doesn't serve Chai Tea Latte. Hopefully they would bring that into Malaysia soon! The above picture was the 2nd time we went and drink, it was on a Tuesday and it was an impromptu outing. Terry came and pick me up and, tadaa off we went to OU! Done with mock exams about two weeks ago. I studied but results are like crap. The real exams are in three weeks and oh lord I don't know how will I fare in that one. Just a short update, promise I'll update soon, and make you go ga-ga over the food photos! And my house internet finally changed from Streamyx to UNIFI! So now I can catch up on all my movies and music and maybe gaming! BRING IT ON! Loading a 10 minute youtube video, takes about half an hour with all the playing and pausing, now it is just play until it ends!